A rather interesting ship docked in the Waterfront in Cape Town a while back. One would think Jan van Riebeeck had just arrived in Cape Town when you looked at the large sailing ship that was moored near the Table Bay Hotel. It's a beautiful red ship with the name of XEPCOHEC on its bows and its other name STS Khersones on its railing towards the rear of the ship. The ship is a 108.6 metres long and 14 metres wide. 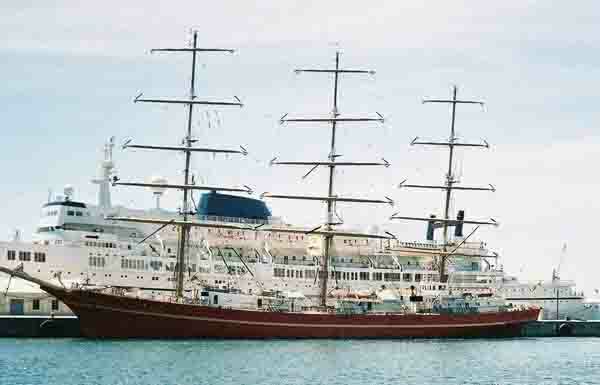 It carries three masts, the tallest of which is 49.5 metres high without antennaes.The ship was built in 1989 in Gdanks, Poland and its home port is Kerch, on the Krim in the Black Sea/Ukraine. As with most navy ships that arrive in Cape Town an open day is arranged for the public to visit. I took the opportunity to go on board and have a look around. The visit was unfortunately confined to the decks. 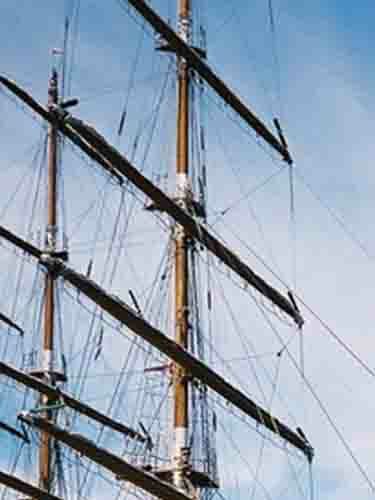 Everywhere there were coils of rope hanging and if you looked up there were the three masts with their cross spars. Just below the spars were ropes that looked like rope ladders hanging sideways and were obviously for sailors to stand on when they were setting the sails. The main mast has three crows nests with the lowest being about 15 metres above the decks. The highest and smallest was about 45 metres above the deck. Standing on the deck looking up I could just imagine myself as a sailor standing up there with the ship rocking from side to side in heavy seas. One minute I'm just about in the sea on the starboard side of the ship, the next heeling over to the port side. The thought of being 45 metres up and swinging like that terrified me. The ship has 60 cadets and 42 regular crew on board. It also has the capacity to carry passengers and has two suites, a number of double and four-bed cabins, all external cabins with modern WC and shower - as well as 12 bed cabin. This standard of luxury is unique for a sailing school ship. On board there is an auditorium which can seat 150 people and which is also used as a restaurant. The Captains Salon, Nina's Bar and the Sailors Club are all areas on board for the crew to relax when off duty. The ship normally sails from Spring through to Autumn between the Black Sea, the Mediterranean, eastern Atlantic, North Sea and the Baltic Sea. Every five or six years the ship goes on an adventure cruise and this year it is doing a cruise visiting various ports around the world. It started its cruise in Kerch in the Black Sea, then on to Piraus, through the Mediterannean Sea touching on at Malta. From there it sailed through the Straits of Gibraltar and into the Atlantic Ocean visiting the Island of Tenerife before sailing across the Atlantic Ocean to Recife and Rio on the east coast of South America. 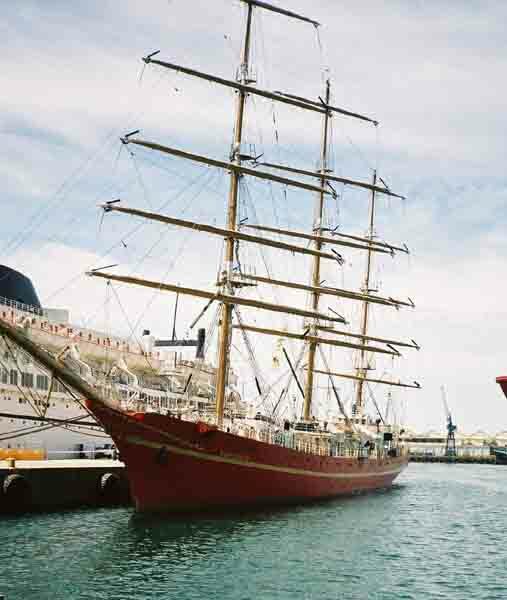 After leaving Rio it sailed across the Southern Atlantic Ocean and arrived in Cape Town on the 18th of February 2004. From Cape Town it will sail up the coast of South Africa to Durban and from their around the east coast of Madagascar visiting St Denis, Port Louis and Port Victoria, all islands in the Indian Ocean. When it reaches Aden at the southern end of the Red Sea it will sail up it through the Suez canal and back to its home port. If everything goes to schedule it will arrive back in its home port in May. The ship on its way to Cape Town actually sailed past the southern point of Africa into the Indian Ocean before it turned back to Cape Town and sailed around Cape Point under full sail What a marvellous sight that must have been seeing the ship in full sail off Cape Point. The ship leaves Cape Town on the 23rd February for Durban. We wish the ship a safe cruise around the southern tip of Africa and a good trip home. Looking up at Table Mountain as we entered the harbour was the highlight for me. It reminded me of a mother welcoming her children home. A feeling I am sure is invoked in every Capetonian when they return to the Mother City. Want to experience a cruise like this? Visit Cape Town and take a cruise on one of the many pleasure boats that do cruises into Table Bay.